Titan XI crew inspects damage from a t-bone collison. 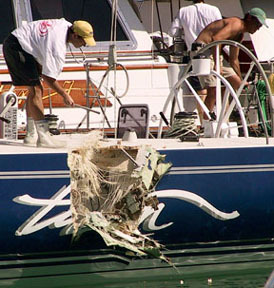 At Key West Race Week in 2002 an Andrews 70, struck Titan XI (an Andrews 68) near the windward mark on the first leg of the second race. last words heard before the "mounting", were from an Aussie crew: "hold on mates, this is gonna hurt"